Waitangi Day, our national day or flag it away? Having witnessed the monumental fails of other nations as they have moved from 'colonial oppression' to self determination it behooves us to work toward a strong and resilient structure based on the unity of our citizenry and the work we do to make the principals of Liberty, Equality and Fraternity present as a fact in our daily lives. Waitangi Day looms again and we are sure to get the usual suspects out making their anger fueled bids for media and sound bites. Where does our nation stand in our minds and what does the constant chat about changing our flag mean to the process of growth and stability? If we change our flag we have to go to the international community and say we have changed who we are, we have moved forward, we have taken a moment to alter our course and we want you all to view this graphic image we choose to stand under and understand something new about us and find respect for that change and the reasons behind it. A National flag is a call to arms, unity...... so, if you are Maori and feeling disaffected and do not think that the arch conservative in Christchurch can stand under your flag as we face the World together, your flag is a fail... equally, if you are that arch conservative and do not think your flag fairly represents and includes all Maori, your flag is also a fail. A change of flag is not a simple logo change, it is a change in thought process and direction, it is a monumental chance for symbolic bringing together of us all to the cause of our nation. It is also a monumental chance for huge dissipation in the belief structure that binds our society together and the opportunity to cast ourselves in the eyes of the rest of the World as, well, twats. To change our flag we must redefine who we are, what we stand for and what we are willing to die for. If we bring that down to the level of "the Canadian one looks nice, lets do something like that" or "well the All blacks Wear it" we are in what can only be described as a philosophical and spiritual nadir. Anything less than excellence in such an endeavor is pedestrian, weak and banal. If you want the fern, or a wave with stars as our flag, slap yourself hard and wake the **** up, you might as well suggest jandals or a chocolate fish. So, a precious chance to unite divided paradigms or a vacuous employment of a pretty design as a feel good logo? 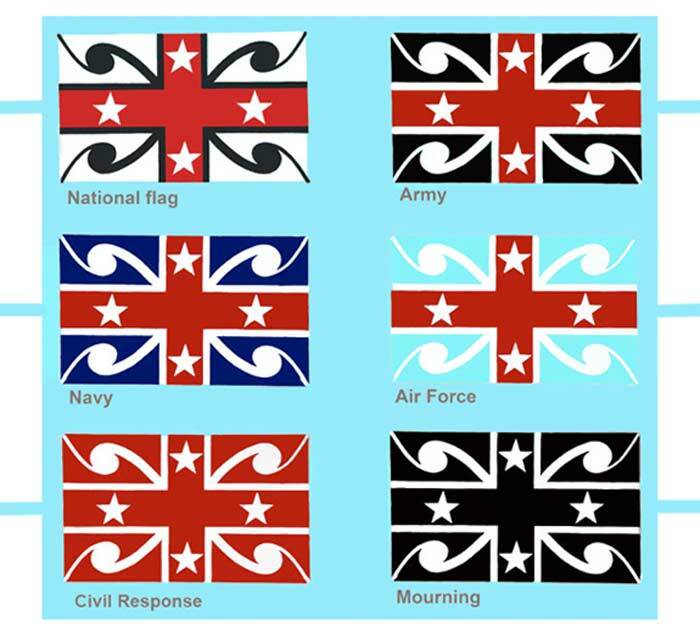 Flags of most note are the national flag we all easily recognize, The United Tribes Flag of the North which was also the Maori Woman's league flag and the newer Tinorangitiratanga flag created to order only a decade ago. Maori have had a love of flags since they first saw them on the early ships. has been obvious this last decade as suggested possibilities and speak to my attitude to those. The New Zealand flag as it stands at present leaves a lot of people cold seemingly because does not differentiate between NZ and Australia clearly enough and it does not hold any special and different New Zealand motif save the Southern Cross. Many see the Union Flag as too much of a lean on our sovereignty by the British Empire. So many flags have been put forward and one which irks especially is the idea of promoting the silver fern, our sporting flag as our national call to arms. In a time when sport has in general far too much sway in our daily thoughts and lives, the idea of promoting the flag of the physical and professional athlete seems vacuous at best. Surely we want more of ourselves and our society and culture than to run fast and jump high even if the virtues of dedication and hard work are espoused in the professional era. There is no doubt that the Fern stands for excellence but we are a country that is much more than this type of endeavor on the World stage. We are a place where the colonizer has become part of the colonized culture in so many ways that it stands alone in the possibility of truly merging into a nation of healed and powerful blended races. This ideal is not known yet but it is possible if we take the next twenty years as seriously we might if we expect great things of ourselves. Some others have happy combinations of waves and or koru with the Southern cross star group. All seem very pleased to be rid of the Union flag and the cross of Saint George. I however think this is one of the key motifs for any flag going into the future. The British secular, democratic meritocracy is how we create individual rights as we may experience them and to this we owe a great debt, our daily individual freedoms and the possibilities these accord us. Some are very frightened of the New Maori flag and what it might mean to peace and equality. But there is a great love of this flag among our indigenous people and as such it should rightly be taken seriously. We have seen a governmental recognition of this recently in it flight over the Waitangi Day celebrations and indeed on the Auckland harbour bridge.... strange that bridges are held in such high regard. The third flag, the United Tribes Flag is also important in that Maori and many Pakeha have seen it as a symbol of sameness and unified effort and respect for years. This flag rests deep in the heart of many Northern Maori and holds serious and specific statements of belief and intent for those people. To choose any one of these flags seems to shut the door on the ideals and aspirations of many of our fellow countrymen but to ignore their histories and designs is also a slap in the face to those who have stood beneath them. The status quo is always possible but if the debate is alive, and it seems to have legs, I have an opinion on how we might spend some of our thoughts when looking at a design under which we might expect us all to stand in a call to war or celebration. The six flags here are the Aotearoaland flag, it's Army, Navy and Air Force. Please bear in mind that AOTEAROALAND is a third space I have created to describe unity of course an effort, a compromise place where Aotearoa and New Zealand meld into a hybrid cultural mi8x of unification and acceptance. The Union Flag is kept as the basis of design but it is deformed in the nature of generic Maori pattern to represent the style and of the Tinorangitiratanga flag and more obviously the colours of the Maori flag as it is often called have been adopted and the stars are still there to set our course by. The weight of colour though has been changed for the national flag and the fighting predominance of red and black have been saved for the army. For as sure as the Tinorangitiratanga flag is a call for strength and unity, it is our armed forces that need this powerful statement. The navy enjoys the colour of the Old Jack which also recognizes our past history with the sea faring nation of Britain and the sky blue has always been a favorite of our air force. This recognition of the past signals is important to keep a generalized respect for the flag among all. While I like this flag I have designed, this little chat is not about getting it adopted but about getting you all to think a little further than, "the Canadian flag looks good with the leaf, we could do that with the fern", and understand that a new flag is a possibility of making a statement of unity between us all, to help create a trust again and take down the boundaries which have sprung up between many and each of us. I reiterate, it is not about being a cute design, it is about a visual language, understanding and representing both who we have all been and who we all want to become.